A doctor of chiropractic will sometimes use x-rays and MRIs to determine if your problem can be helped through chiropractic adjustments. Diagnostics can show the severity of your problem and the length of time you have had it. 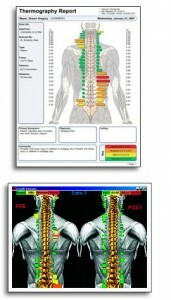 We also use state of the art thermography to view the health of your spine and nervous system without exposing you to radiation. If you have x-rays or other forms of diagnostic imaging (MRI, CT scan, etc.) in your records, please bring them with you on your initial visit with Dr. Bagnell. In the case of a pregnancy, we will use the Tytron thermal scan to determine problem areas. As you can see by the x-rays, a misalignment to your pelvis can be the main reason for your malpositioned baby. The human body and all of its organs are controlled by the nervous system. These nerves run from the brain down the spinal column, and innervate various organs throughout the body including the heart, the lungs, and even the skin. The Tytron is definitely a safe thermographic tool. The Tytron is a non-invasive diagnostic tool, using infrared temperature sensors. In other words, it’s like a thermometer measuring a fever. This is why we chose this tool to carefully and specifically evaluate the mother-to-be. The Tytron records body temperature allowing doctors to make their analysis based on its objective readings. So where does the Tytron fit in? In less than 15 seconds, the Tytron can be used to detect areas of asymmetry as well as indicate areas that may be warm due to acute soft tissue damage, whereas colder regions may indicate long term chronic issues. The Tytron utilizes precision sensors, specialty lenses, and a unique focusing system to give us the most accurate and repeatable information available.